I promised you a Simply B Stamps project and here it is! SBS teamed up with The Stamping Chef to face off in a Roller Derby Challenge! Each offered an image for free to anyone who wanted to enter their challenge. If you requested it, you HAD to participate. Since I wasn't sure I could commit to two projects I chose to work with Betty's Bonnie Skullbabe. The challenge was pretty simple: use a black, hot pink, and lime green color scheme. I colored Bonnie with Copics and fussy cut her. The papers are Basic Grey - Sultry. 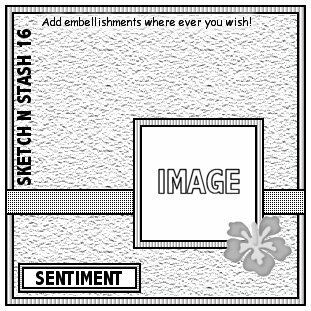 My sketch is the current Sketch N Stash (#120) with a few extra elements thrown in. Roller Derby is a pretty rough sport from what I know of it. Players are aggressive and competitive. This is what inspired my sentiment and the DOA tag. Please note that I do not condone violence and this is meant metaphorically and tongue in cheek! 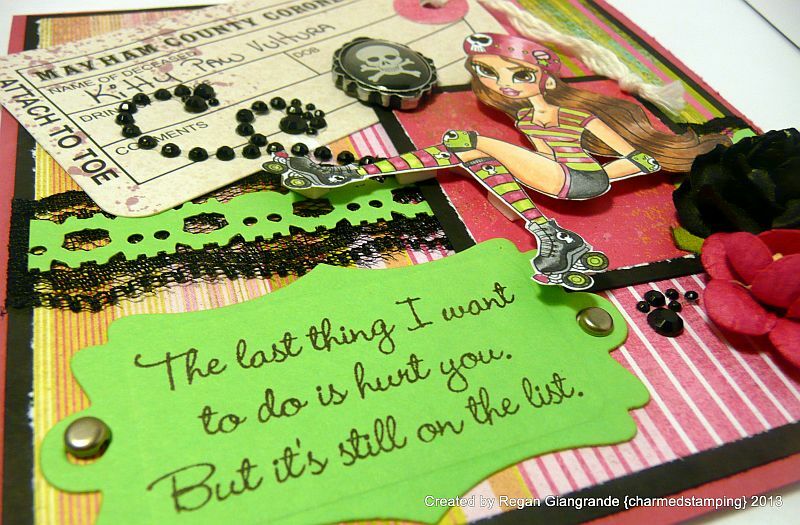 The sentiment is from the My Favorite Things stamp set called Twisted Foursome and it is cut with a Grommet Tag from Spellbinders. The tag is a drink tag from Recollections that I found with the Halloween party goods at Michaels last year. I never used them, but I had a flash of inspiration and pulled one out, inking the name of Bonnie's nemesis, Kitty Paw Vultura, on the tag. (I'm not sure if they misspelled "mayhem" on purpose or not! lol) I used a skull and crossbones border punch from Martha Stewart and added a bit of bling and some flowers. The skull cameo is Jolee's Boutique, another Halloween purchase from last year. Both images are fabulous and are now for sale in their respective stores. Markers used: Copics (E00, E11, E21, E23, E25, E27, E79, R20, R81, R85, RV19, YG13, N0, N2, N4, N6, N8). Fab card - great colouring. Thanks for playing along with us at Sketch n Stash this time. Gorgeous card Regan. Love both images and love the colors you have used. Love the papers and the great sketch. 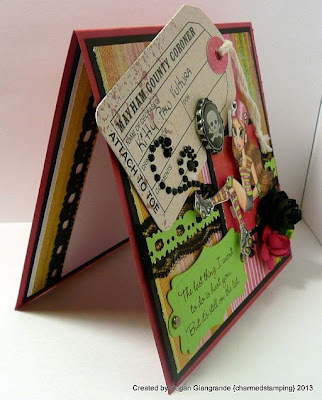 Fabulous card, I like the image,the embellishments and the design. Thank you for joining i with us at Sketch N Stash Challenge, Good Luck. 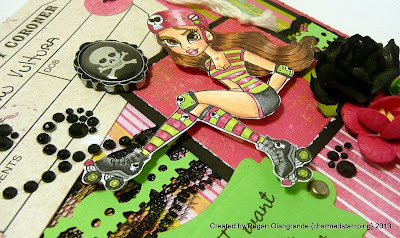 Thanks for sherring it with us at Sketch N Stash challenge blog.